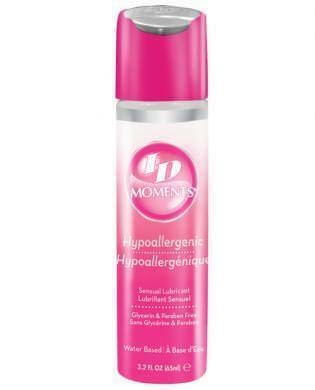 ID Moments Hypoallergenic Sensitive Lubricant. The most gentle lubricant made today. Gentle and soft! Smooth and sensitive. ID Moments is your solution to your search for a paraben free, glycerin free, and hypoallergenic lubricant! This water based formula is the softest and gentlest adult lubricant in our line and is also safe to use with your favorite adult toy. ID Moments is ideal for anyone who may have sensitive skin and allows for worry-free and long lasting fun! Ingredients: Water / Aqua / Eau, Butylene Glycol, Carboxymethylcellulose, Hydroxyethylcellulose, Ammonium Acryloydimethyltaurate /VP Copolymer, PEG-45M, Citric Acid, Sodium Benzoate.